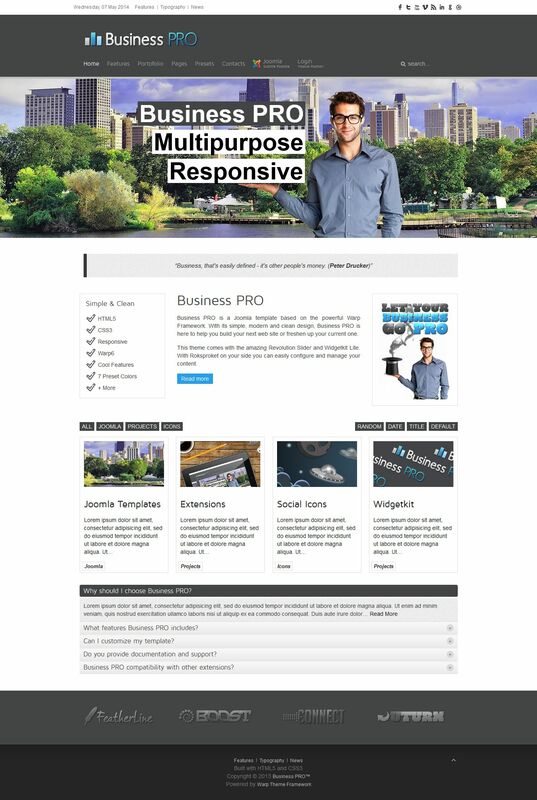 TF Business Pro - an excellent template from ThemeForest trading platform with full support for versions 3.0 and Joomla 2.5. This template is designed for popular frameworks Warp, which combines the latest achievements of the web - technology. Template perfectly optimized, has adaptive functions that allow the site displayed correctly on different screens. Design layout includes 7 preset color schemes and 5 original modular variations. In the assembly is magnificent module Revolution Slider, allowing to display important information in an unusual way. In the installation package includes additional third-party extensions, and significantly increase the potential of the template. TF Business Pro - a perfect solution for creating professional-quality websites and various subjects.